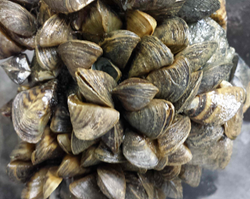 Zebra mussels and quagga mussels, two aquatic invasive species causing costly bio-fouling problems at power plants, can now be controlled effectively with EarthTec QZ. The unique liquid formulation of EARTHTEC QZ is an effective new treatment. “The mussels do not sense EarthTec QZ as a threat and readily ingest it”, says David Hammond, PhD. Zebra mussels and quagga mussels, two aquatic invasive species causing costly biofouling problems at power plants, can now be controlled effectively with EarthTec QZ. For power plants seeking a convenient, ecofriendly, economical and reliable solution to their zebra mussel problems, EarthTec QZ is an effective and permanent solution. Manufactured by Earth Science Laboratories Inc., EarthTec QZ is an algaecide and molluscicide that kills zebra and quagga mussels on intake screens, in pipes, storage ponds, cooling towers and lagoons. It prevents recolonization. The unique liquid formulation of EARTHTEC QZ exterminates adult mussels and prevents infestation by larval–stage veligers. QZ can be easily applied directly to lakes, reservoirs and pipelines, which makes it one of the few viable water treatment alternatives in the battle against these invasive species. EarthTec QZ is the only product for zebra mussels that is both EPA labeled as a molluscicide and certified by NSF to Standard 60 for use in drinking water. These important characteristics make it a safe and practical choice for many locations and situations. Water treatment plants have commonly used chlorine (usually as sodium hypochlorite) for pre-treatment to control mussels. However, chlorination of raw water is known to cause disinfection by-products (DBPs) such as trihalomethanes (THMs) and haloacetic acids (HAA5s), which can cause cancer. As regulators continue to tighten the standards governing disinfection by-product compounds, public water agencies are turning to EarthTec QZ as a legal, effective, and economical solution. EarthTec QZ is not only one of the most affordable, but also one of the most effective chemical treatment programs for killing zebra and quagga mussels. “The mussels do not sense EarthTec QZ as a threat and readily ingest it”, says David Hammond, PhD. “They are killed in just 2-4 days while improving overall water quality.” Hammond adds that longer exposure times may be required for cooler waters. EarthTec QZ was selected as a Top 10 New Water Technology product at the 2014 AWWA Conference. EarthTec offers on-site evaluations and full service programs to monitor and optimize chemical costs. All EarthTec products are made in the USA.